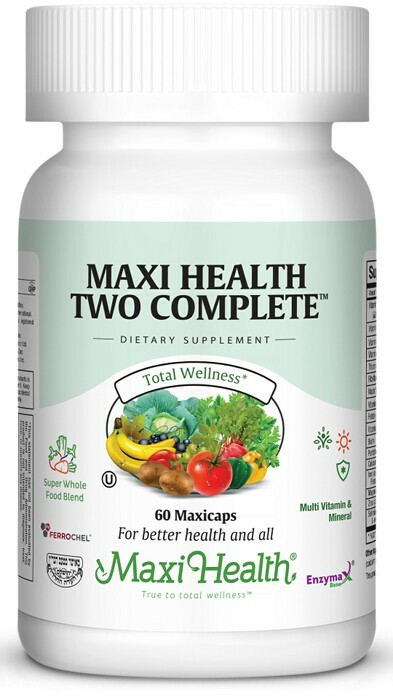 Maxi Health Two Complete™ is our well balanced, just 2 a day multi-vitamin. We combined essential vitamins and minerals, in a synergistic blend, to support your health and help you get through the day. Get yourself and your family on board with proper supplementation. For a formula that works, get Maxi Health Two Complete™. Vegetable cellulose, magnesium stearate, microcrystalline cellulose, Enzymax® (calcium carbonate, bromelain, papain, lipase, amylase, protease, silica). CaroCare® is a registered trademark of DSM Food Specialties. trademark of Maxi Health Research® LLC. Selenium SeLECT® is a registered trademark of Sabinsa Corp.